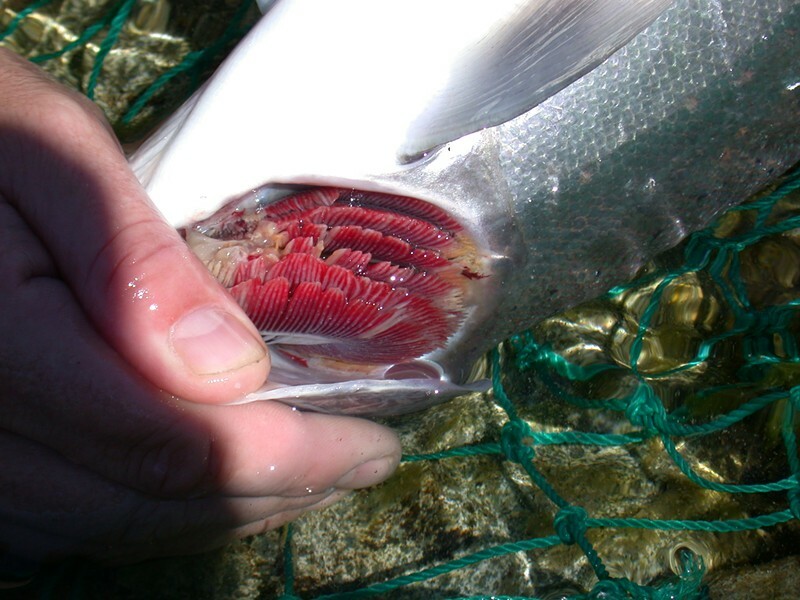 A steelhead infected with Ich during the 2002 Klamath fish kill. North Coast Congressman Jared Huffman released a statement decrying the "preposterous" and repeated attempts of Southern California water districts to prevent water releases into the Trinity River. He also had some choice words for the "drumbeats of distortions from the districts' PR machine." See the full press release and statement below. The Yurok Tribe announced this afternoon that a federal judge has denied a water district's motion to stop the release of water into the Trinity River aimed at improving water conditions that scientists believe could cause a catastrophic fish kill. The release of additional flows from Lewiston Dam into the Trinity River, which feeds the Klamath, is expected to continue into late September. A few minutes ago, Judge O’Neill of the United States District Court for Eastern California in Fresno denied Westlands and San Luis & Delta-Mendota Water Districts’ motion to immediately halt flows from the Trinity River necessary to avoid a catastrophic fish kill in the lower Klamath River. The Court determined that any potential harm to the irrigators from an uncertain loss of added water supply was outweighed by the potentially catastrophic damage to salmon in the absence of supplemental water. The Klamath River was the site of a catastrophic fish kill in 2002 that claimed between 33,000 and 78,000 Chinook salmon, including hundreds of threatened coho salmon. In subsequent years, adequate river flows have prevented a repeat of this catastrophe. The Yurok Tribe and its fisheries co-managers including other tribal, federal and state agencies, have worked hard to develop the science that guides these difficult decisions. The Yurok Tribe maintains senior water rights sufficient to maintain its fishery in the lower Klamath River. “Here we go again. As preposterous as it is for San Joaquin Valley irrigation districts to attempt to lay claim to Humboldt County’s desperately needed Trinity River water, it’s no surprise. The Westlands Water District and their allies have been relentless in pursuing an agenda of stealing water from other regions and gutting vital protections for California’s economically and culturally vital salmon populations. When courts or state and federal agencies uphold the laws that protect North Coast fisheries and the many people and jobs that depend on them, you can always expect a Westlands lawsuit — in addition to their never-ending lobbying in Washington and Sacramento and the constant drumbeat of distortions from their PR machine. “The Department of the Interior’s decision to make emergency releases of cold water from Trinity Lake to avoid an economically and environmentally devastating fish kill in the Trinity and lower Klamath Rivers is the right thing to do, and it will be upheld in court just as it was last year and the year before that. “This water does not belong to Westlands or the CVP. As the Interior Department’s Solicitor acknowledged in a legal opinion last year, a 1955 Act of Congress and subsequent federal water contract guarantee Humboldt County and downstream water users the benefit of this water. "Let’s be clear that both my replacement Tim Sloane and I are outraged by yet another water grab by Westlands," said Zeke Grader, Executive Director Emeritus of the Pacific Coast Federation of Fishermen's Associations. "Despite what certain presidential candidates may say, this water is desperately needed for California’s environment and its fisheries." "To think that industrial irrigators 400 miles away have a stronger claim to that water than salmon, and the fishermen and women who depend on them, is outrageous," said Tim Sloane, Executive Director of the Pacific Coast Federation of Fishermen's Associations.